Fans of Reggae music understand how intimately tied it is to the Rastafarian movement from which it was born. 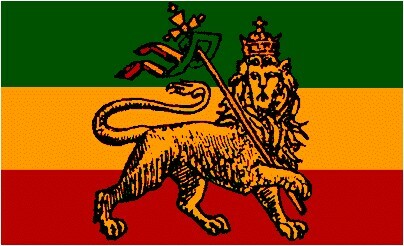 Rastafari is a religion, a philosophy, a way of life and a social movement. Depending on whom you ask regarding the nature of Rasta, you’ll get a different combination of these basic premises. Rastafari emerged from the poor black communities of Jamaica in the 1930s. The roots of the ideology lie heavily in the collective experience of slavery and Marcus Garvey’s back to Africa movement. The poor religious people in the shanty towns of Jamaica may not have known much about world history, but they understood the Old Testament stories referring to Egypt and Ethiopia were taking place in Africa; that mystical homeland that legend had endowed with mythic stature. In 1930 an Ethiopian nobleman Ras Tafari was crowned Emperor of Ethiopia, taking the name Haile Selassie I, the “Conquering Lion of Judah.” A small group of Jamaican faithful saw this as the fulfillment of the prophecy found in Revelation 5:5. Immediately a religion converged exalting Selassie as the second coming of Jah (God), and the reincarnation of Jesus Christ. They called themselves Rastafarians, taking the Emperor’s pre-coronation name. Rastafarians adopted the Ethiopian Coptic Orthodox epic, the Kebra Negast as a scripture. This book explains how the Ethiopian people are descended from the Israelites. The story depicts the courtship of King Solomon and the Queen of Sheba who, according to the text had a son named Menelik. Menelik was raised in Ethiopia with his mother. After visiting his father Solomon in Israel once, Menelik returned to Ethiopia with a population of Israelites under the protection of the Ark of the Covenant which they brought with them. For these reasons Rastafarians consider themselves to be the true Israelites and Ethiopia to be the true Zion, rather than Israel; the Zion of Judaism and Western Christianity. For the past several hundred years in Ethiopia there lived a community of black African Jews called Beta Israel, isolated from the greater influence of Rabbinic Judaism. Rastas pointed to this community as evidence supporting their legend of an Ethiopian Zion. After Salassie I visited Jamaica in 1960 waves of Rastas began immigrating to Ethiopia where they founded Shashemene Village. The lost Israelites had begun their repatriation to Zion. An ironic twist in this epic came in 1970 when the nation of Israel enacted the Law of Return, giving Jews and Jewish descendants the right to immigrate to Israel and gain Israeli citizenship. The Beta Israel quickly sought their right to return to their traditional homeland. During the 1980s civil war broke out in Ethiopia and famine struck the nation, threatening the Beta Israel community’s survival. In 1984 in an effort to rescue the exiled Jews, the government of Israel executed Operation Moses; evacuating thousands of Beta Israel and repatriated them to Israel. In 1991, Israel’s Operation Solomon brought the remaining Beta Israel to Israel. The entire Beta Israel community, numbering 120,000 people now lives in Israel. The lost Israelites have returned to Zion.